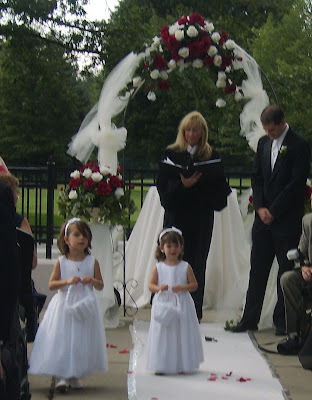 Against our better judgement as parents, as a happily married couple, as wedding goers, as people who will be within a 100 mile radius of Shady Hollow Country Club, my husband and I agreed to let our little angel serve as a flower girl in my sister's wedding. Actually, I agreed. He has perfected the art of NEVER making a decision, so that later he can say: This was all your idea. Not only did we need to maintain the delicate balance of rest, hydration, nutrition, and baby dolls that keep a two year-old girl in equilibrium, we needed to do it from a hotel room, four hours away. But we did have our challenges. About 3 1/2 hours into the trip, we heard our four year-old from the back seat say I have to poooo... blahhhhhhhhhhhh. I was driving, so as I flung wipes into the back and looked for a exit, my mother heroically flipped around in her middle bucket seat and began trying to stem the tide. We finally made it to an exit. The exit from hell. There was construction EVERYWHERE, so when we finally pulled into the abandoned lot of a natural gas distributor, we jumped out like some crazed multi-generational Chinese fire drill. When we finally made it to the hotel, I learned that their washer was broken and laundry service wasn't available until Monday (thanks for the top-notch service Courtyard Marriott Canton!). This left me with an hour to bathe a slightly rancid child and a VERY rancid car seat and shorts one after another in the bathtub. Our poor little Justin remained touch and go the rest of the weekend, but he managed to keep it together for the major events. Back to the flower girl. Morgan loved her little white dress so much that we didn't have any trouble getting her ready for the big event. In the moments before walking down the aisle, I promised her a necklace just like her cousin's and (sticker) earrings like the flower girl from the other side of the family. Morgan kept spilling her rose petals prior to the ceremony and the other flower girls were happy to help pick them up--and add them to their own baskets. When they got to the end of the aisle, the two cousins had run out of petals, so they began picking them back up. 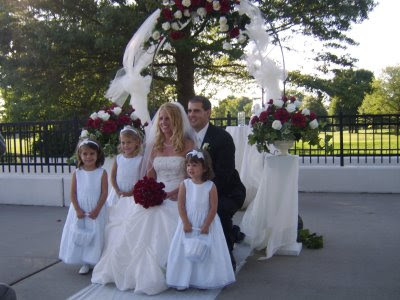 But they soon found their seats and the ceremony proceded without incident. Congratulations to Susan & Mike on breaking the family wedding weather curse. We wish them all the happiness in the world and all the best in blending two families.